When the Council is not in some sort of disagreement with an Emperor, its members are often looking for ways to curry favor with the Ruby Throne. Each member receives an amulet worth a small fortune which is specially crafted as a symbol of their office. 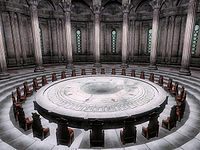 As a prominent family in Cyrodiil garners more and more power and repute, people eventually start thinking it's just a matter of time before they obtain a representative on the Council, though it's not clear exactly how new Council members are appointed. While its importance cannot be overstated, much of the Elder Council's responsibilities consist of the intricate but dull problems of running an Empire, such as administering Imperial taxes on vassal kingdoms. [nb 4][nb 5] The Council only tends to get noticed when its members are dealing with some emergency or power struggle related to the Emperor. The Council is responsible for recognizing and crowning the next ruler upon the death of the Emperor, and they are tasked with running the government in the interim under the leadership of the High Chancellor, the de facto leader of the whole Empire during such periods. Abnur Tharn - High Chancellor of the Elder Council circa 2E 582, one of the Five Companions, and a disciple of Molag Bal. Councilor Itinia - A member of the Elder Council circa 2E 582, who took shelter in the Imperial Sewers after the city was invaded during the Planemeld. ^ Dexion Evicus' dialogue in Dawnguard. ^ Delvin Mallory's dialogue in Skyrim. ^ Arriana Valga's dialogue in Oblivion. ^ a b SPECIAL EDITION! - EMPEROR AND HEIRS ASSASSINATED! ^ Light the Dragonfires quest in Oblivion. Esta página foi modificada pela última vez à(s) 14h21min de 13 de março de 2016.